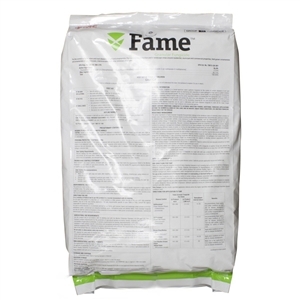 Fame Granular Fungicide (Disarm substitute) - 25 lbs. 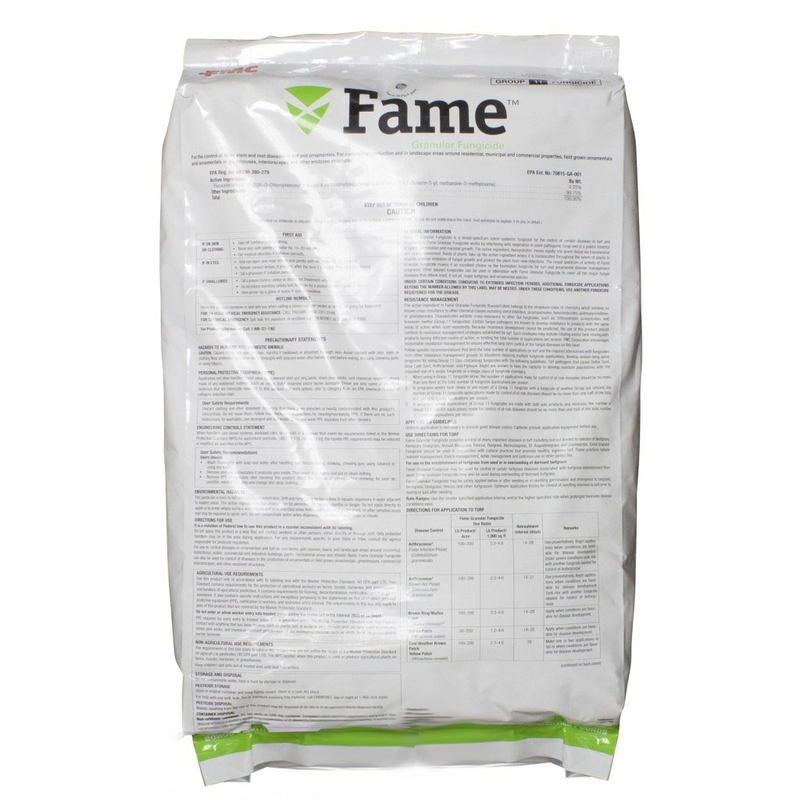 Fame Granular Fungicide (Disarm G substitute) - 25 lbs. Si usted no entiende la etiqueta, busque a alguien para que se la explique a usted en detalle. •	Take off contaminated clothing. •	Rinse skin with plenty of water for 15–20 minutes. •	Get medical attention if irritation persists. IF IN EYES: •	Hold eye open and rinse slowly and gently with water for 15–20 minutes. •	Call a physician if irritation persists. IF SWALLOWED: •	Call a poison control center or doctor for treatment advice. •	Have person sip a glass of water if able to swallow. if calling from outside the U.S.
1-703-527-3887 if calling from outside of the U.S. CAUTION: Causes moderate eye irritation. Harmful if swallowed or absorbed through skin. Avoid contact with skin, eyes or clothing. Wear protective eye wear. Wash thoroughly with soap and water after handling and before eating, drinking, chewing gum, or using tobacco. resistant to this product. For more options, refer to category A on an EPA chemical resistance category selection chart. and hot water. Keep and wash PPE separately from other laundry. (WPS) for agricultural pesticides [40 CFR 170.240 (d) (4-6)], the handler PPE requirements may be reduced or modified as specified in the WPS. •	Wash thoroughly with soap and water after handling and before eating, drinking, chewing gum, using tobacco or using the toilet. •	Remove clothing immediately if pesticide gets inside. Then wash thoroughly and put on clean clothing. thoroughly and change into clean clothing. surface water is present or to intertidal areas below the mean high water mark, or other sensitive areas that may be exposed to spray drift. Do not contaminate water when disposing of equipment washwater or rinsate. requirements specific to your State or Tribe, consult the agency responsible for pesticide regulation. and industrial buildings, parks, recreational areas and athletic fields. requirements for the protection of agricultural workers on farms, forests, nurseries, and greenhouses, and handlers of agricultural pesticides. interval. The requirements in this box only apply to uses of this product that are covered by the Worker Protection Standard. Do not enter or allow worker entry into treated areas during the restricted-entry interval (REI) of 12 hours. resistant gloves made of any waterproof material, such as nitrile, butyl, neoprene, and / or barrier laminate. Keep children and pets out of treated area until dust has settled. Store in original container and keep tightly closed. Store in a cool dry place. For help with any spill, leak, fire or exposure involving this material, call CHEMTREC day or night at (703) 527-3887 or 1-800-424-9300.
with respiration in plant-pathogenic fungi, and is a potent inhibitor of spore germination and mycelial growth. may include rotating and/or tank-mixing with products having different modes of action, or limiting the total number of applications per season. Arysta LifeScience encourages responsible resistance management to ensure effective long-term control of the fungal diseases on this label. are known to have the capacity to develop resistant populations with the repeated use of a single fungicide or a single class of fungicide chemistry. of the total number of fungicide applications per season. applications made for control of at risk diseases should be no more than one half of the total number of fungicide applications per season. Uniform application is necessary to provide good disease control. Calibrate granule applicator equipment before use. judicious use of other fungicides and cultural practices. Fungicide may also be used during overseeding of dormant turfgrass. fescue, and other turfgrasses. Optimum application timing for control of seedling diseases is just prior to, during or just after seeding.